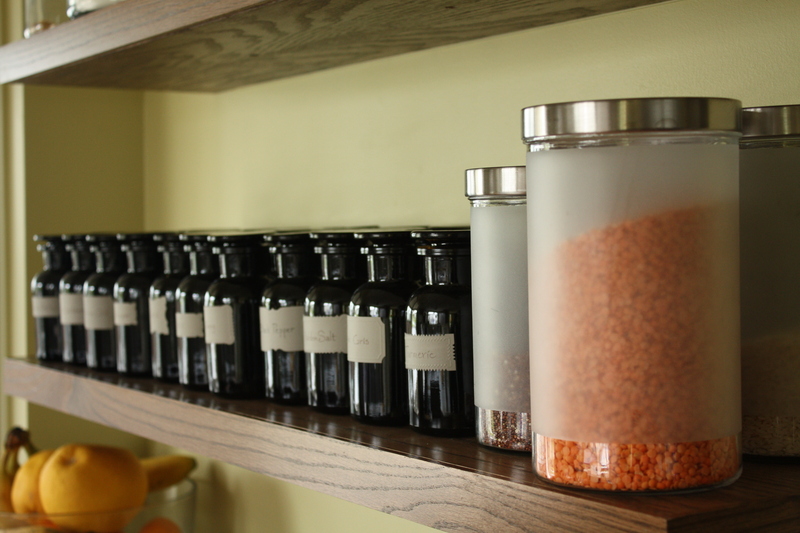 My favourite part of our kitchen, since our renovation, is the shelf that cradles my collection of spices and herbs. I can travel the world just by inhaling the heady aromas enclosed in the purple apothecary jars that preserve the flavourful treasures within. I’d like to share some of these seasonings and why they make me so giddy! 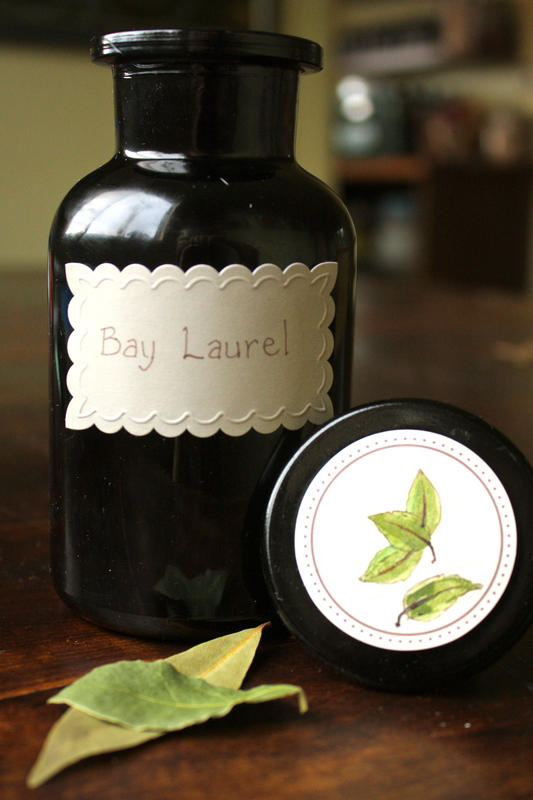 The scent of Bay Leaf always takes me back to the California coast where groves of California Bay Laurel trees fill the air with a heady scent as the trees sway in the constant ocean breeze. My other strong scent associated memories of California are the night-blooming jasmine in Napa and the ever-present scent of Ranch Dressing in the capital city of garlic, Gilroy. 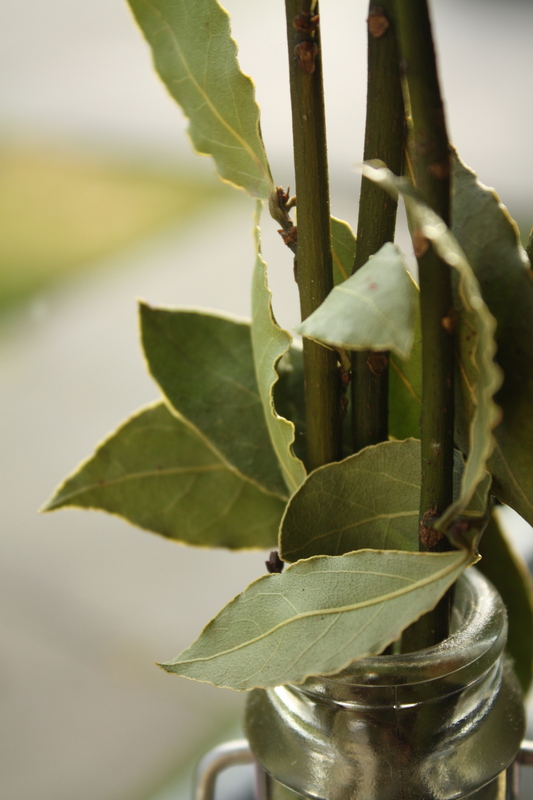 While the leaves of the California Bay Laurel can be used for seasoning dishes, the more subtly flavoured Bay Laurel that is native to the Mediterranean is more commonly used in cooking and more widely available. There are also other varieties of Laurel trees outside of Europe that are used in local cuisines, including: Indian Bay Leaf, Indonesian Bay Leaf, West Indian Bay Leaf and Mexican Bay Leaf. Each has a different flavour profile, but they all have a similar appearance. While dried Bay Leaf can be purchased at any grocery store, it’s always better to dry the fresh leaves yourself for maximum flavour. While I have never been lucky enough to have my own Bay Laurel, I have been the recipient of branches from generous friends and neighbours who have. 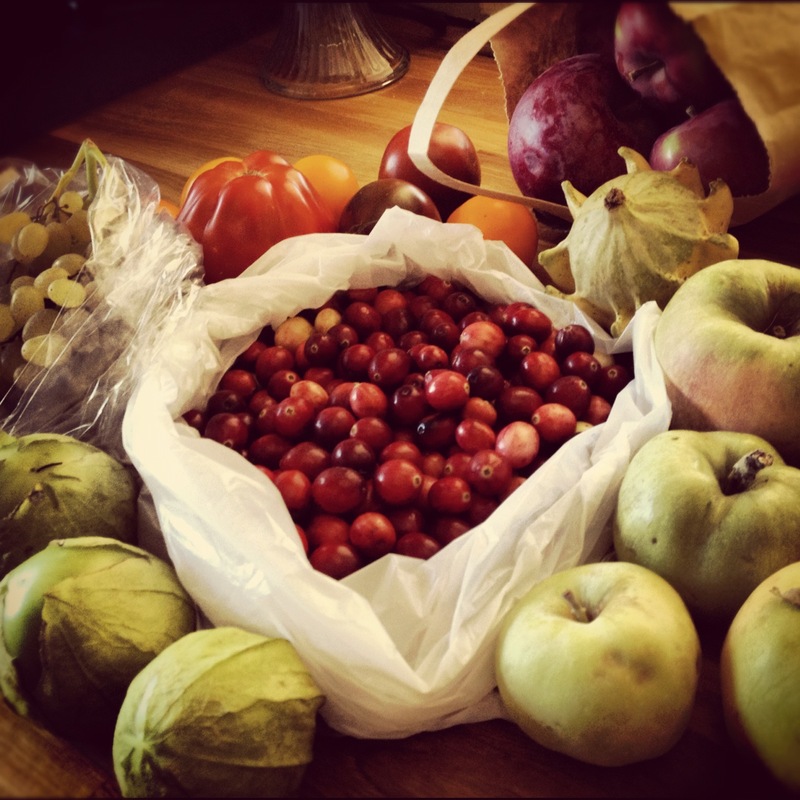 My most recent bough was overflow from a bushel given to my mother. The fresh leaves are quite mild and need to be dried for several weeks to reach their full flavour capacity. I like to use the newly dried leaves as I find the flavour is more buttery and rich. 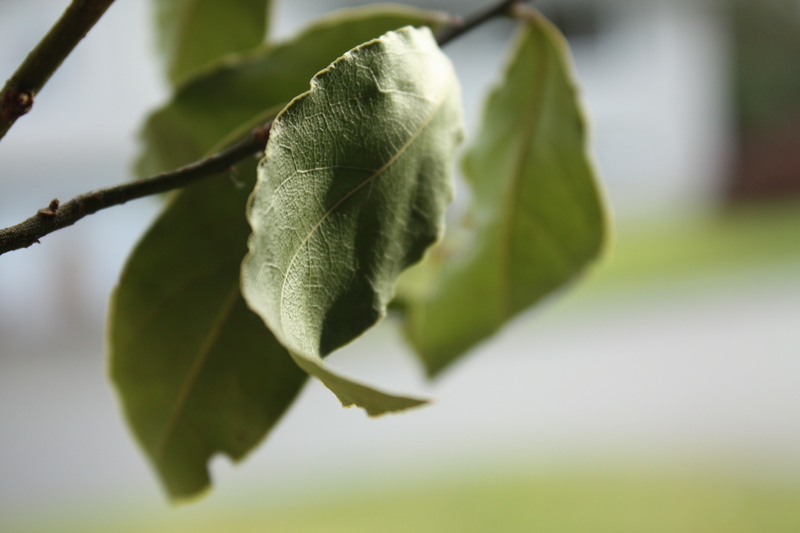 In the photo below, the leaf on top is one from the branch above and the bottom leaf was purchased. I use Bay Leaf in almost every soup and sauce that I make (including Cranberry Sauce), as it works well with most other spices and herbs adding a slightly floral complexity. I always use whole leaves and fish them out near the end as they are inedible unless ground to a fine powder. You can also place the smaller pieces in a tea ball or muslin bag, which can also be improvised with cheese cloth. As with many herbs and spices, bay leaves have long been used for their medicinal properties, but the leaves of the laurel tree are most often associated with the laurel wreaths worn by Olympians in Ancient Greece and victors of war in Ancient Rome. Bay Leaf is always a winner in my books and I will continue to rest on my laurels when I’m looking to create a more complex flavour. 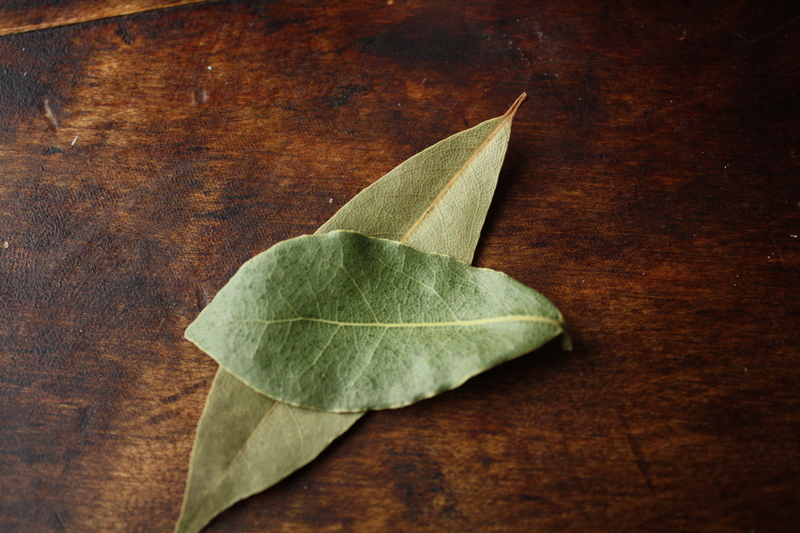 What dishes just wouldn’t be the same without a hint of bay leaf? Posted in Herbsday, Ingredients, Places and tagged apothecary jars, bay, bay laurel, bay leaf, bay leaves, Cranberry sauce, flavorings, flavour, flavourings, food, herbs, laurel, plants, sauce, seasoning, seasonings, soup, spices. Bookmark the permalink. When the leaves twist and turn and fall into colourful piles, waiting for boots to crunch their way through, it’s time to prepare for comfort food simmering on the stove. Years ago we started a tradition for Thanksgiving and Christmas that Young Fresh Chef and I make a batch of homemade cranberry sauce. Mostly I do the prepping and cooking and he just lets me know when it is sweet enough. I had always been a fan of the canned variety, piling it on turkey sandwiches and maybe even eating a spoonful on the sly. But when you look at the ingredient list on the can it is short and sweet: CRANBERRIES, GLUCOSE-FRUCTOSE, GLUCOSE, WATER. I knew I could do better. 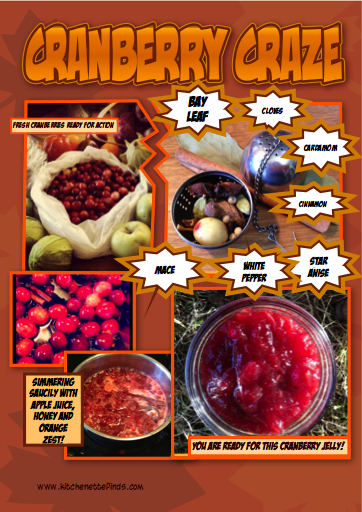 I researched recipes years ago and I took the bits and pieces that appealed to me and created my ultimate cranberry sauce! The least daunting of the traditional turkey accompaniments, it’s a great take along if you are invited to a holiday feast. Living in the heart of B.C.’s cranberry country, I can usually buy cranberries in the Fall, fresh from the bog, at the local Farmers’ Market. They are also easy to find in the produce section in your grocery store this time of year. I usually pick up some extra to fill a vase or pile around a pillar candle for a centre-piece. 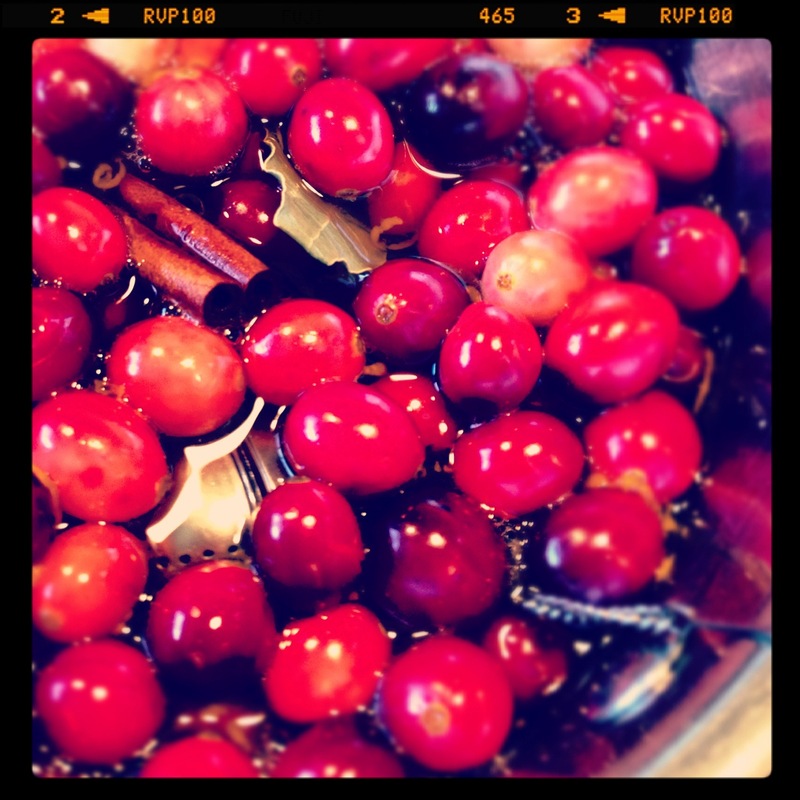 Once you have the cranberries, next come the seasonings, and while it is necessary to add some sweetener to balance out the pucker inducing tartness of the berries, you can also add some holiday spice to add layers of flavour. The key to keeping it on the savoury side instead of being jelly is bay leaf and white peppercorns. By placing the smaller spices in a tea ball (or a cheese cloth pouch) you don’t have to fish them out individually, or wonder where that last clove is hiding. 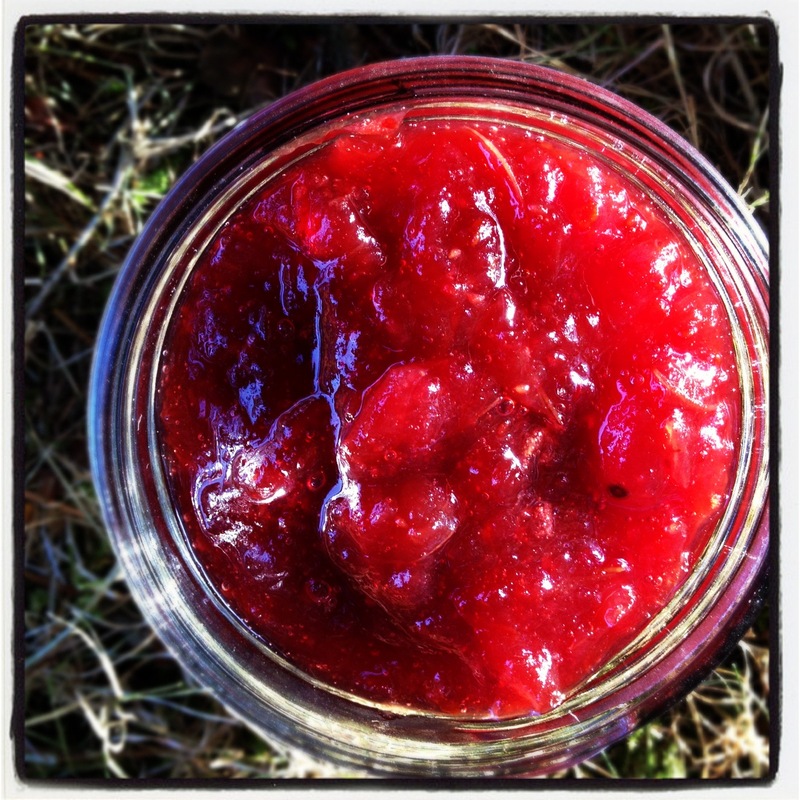 While cranberry sauce completes the holiday table and elevates turkey to a special occasion, it’s also great mixed in with yogurt and granola, slathered on a peanut butter sandwich or maybe just a straight spoonful or two! 1. 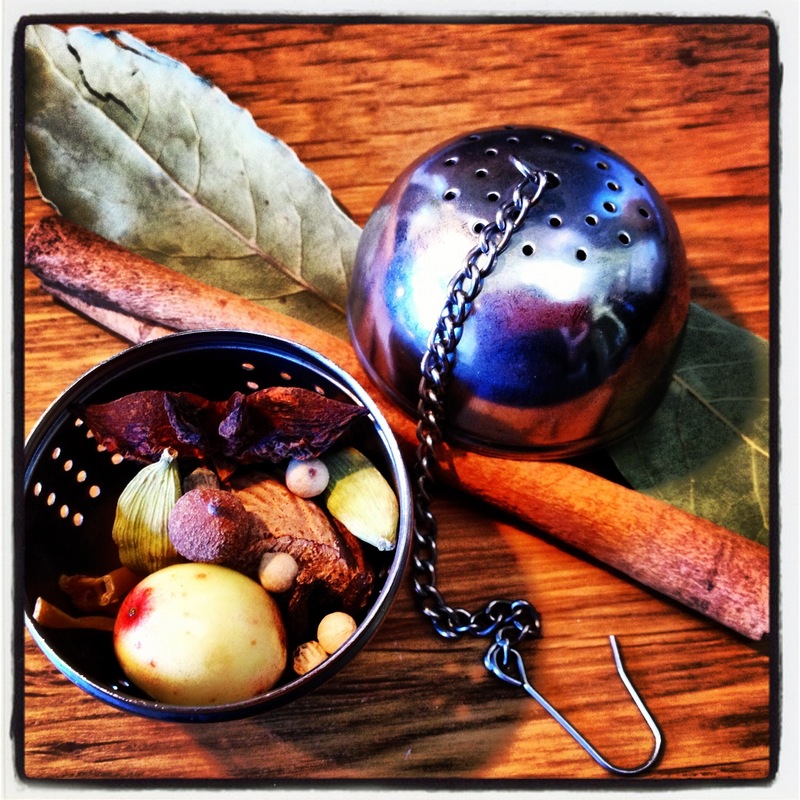 Place small spices in a tea ball or make a cheesecloth pouch tied with string. 2. Place all ingredients in heavy large saucepan. 3. Bring to a boil over medium heat. 4. Simmer until berries burst and sauce thickens, stirring occasionally (about 20-25 minutes). 5. Remove cinnamon stick, bay leaves and spices. 6. Allow to cool, the sauce will thicken up even more. 7. Refrigerate sauce until cold. 8. Serve with turkey, or yogurt or swirl into muffin batter! The sauce can be made up to 3 days ahead. Cover and keep refrigerated. Share your favourite homemade holiday tradition in the comments. Posted in BCLocal, Comics, Holiday, Ingredients, Kid Friendly, Recipes, Snacks, Treats and tagged allspice, apple juice, bay leaf, Christmas, cinnamon, cloves, condiment, Cook, Cranberries, Cranberry, Cranberry sauce, food, ginger, Holidays, homemade, homemade cranberry sauce, honey, Ingredient, mace, nutmeg, orange, peppercorn, recipe, star anise, tea ball, Thanksgiving, vegetarian, zest. Bookmark the permalink.